Dr. Tejas Patel’s landmark remote percutaneous coronary interventions (PCIs), performed with 20 miles between the physician and the patient last year, served as the foundation of our submission for this recognition. The world’s first remote PCI procedures, performed using CorPath GRX with developmental remote technology, demonstrated the system’s ability to deliver timely, specialized treatment to underserved patient populations regardless of geographic location or socioeconomic status. The technology also allows all physicians to perform highly precise interventional procedures to optimize patient outcomes. 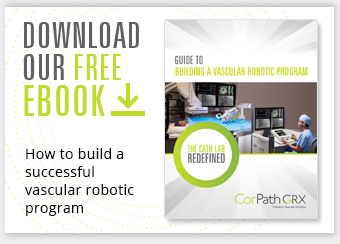 Patients suffering from highly emergent and time sensitive events, like heart attack and stroke, stand to benefit tremendously from remote vascular robotic technology. These time critical procedures led Corindus to pursue a new indication for neurovascular treatment that is currently in review with the FDA. If you would like to learn more about CorPath GRX’s pending indication in neurovascular intervention, Dr. Aquilla Turk, CMO for neuro-endovascular treatment, spoke recently to Health Data Management about it here. Pick up the print edition of Fast Company when it hits newsstands on April 16 to see the full rundown of winners, finalists and honorable mentions for the World Changing Ideas Awards. You can also follow @FastCompany on social media and search the hashtag #FCWorldChangingIdeas to get even more insights.